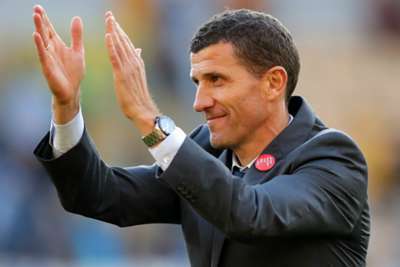 Javi Gracia claimed Watford had achieved a rare feat by managing to "dominate" in-form Wolves in their Premier League victory on Saturday. Two goals in 58 first-half seconds from Etienne Capoue and Roberto Pereyra saw Watford triumph 2-0 at Molineux, earning a first win in five Premier League matches as they leapfrogged Nuno Espirito Santo's men into seventh place. Wolves, meanwhile, saw a six-game unbeaten run brought to an abrupt end with their first home defeat of the campaign, and Gracia was keen to highlight how impressive his side's display had been. "Very pleased with the performance," the Watford boss said to Sky Sports. "We have played really well in the first half, we dominated, created chances and scored two goals. "It was the key of the game to score two goals in the first half, after that we felt comfortable in possession - we had more than Wolves. Everyone knows Wolves are playing really well this season, it is not easy to control and dominate the game and we did it. I'm very happy with the supporters as well who are with us regardless of the results. This is a good reward. "Second half, in the beginning they pushed us a little bit and then we managed the game well. "After the last defeat playing at home [4-0 against Bournemouth] I think the players deserved this result. In the last game all of us knew we played not as bad as conceding four goals [looks], we played two games in one - a bad 30 minutes in the beginning and after sending off playing with 10 players. "[In this game] I think we have been concentrated from the beginning." Nuno, meanwhile, accepted Wolves had been second best in all areas, though he was at least satisfied with his players' determination. He said: "Yes, [Watford deserved it], they were better than us as a team. "They began well. We didn't play well, particularly in the first half. We didn't stick to our rules and tasks, they were better than us and they achieved a deserved victory. All over they were better, they were more compact and we made too many mistakes in our possession. "We allowed them to recover the ball and create situations. In the other parts we didn't move it, break, or have enough mobility to create space. "Not very good in first half, in the second half better. Even if we lose we must lose like this, with this attitude, energy and knowing we must play the game until the end." Asked if conceding a second goal so soon after the first was particularly frustrating, Nuno responded: "Every goal is annoying [but] we must not do it again. "There must be a moment of calmness realising [you need] control of the game even if you concede a goal. You must be organised. "This is tough and we must bounce back." Tough day at the office as Wolves fall to just their second defeat of the season and first at home since January. Attention now turns to @OfficialBHAFC next weekend.